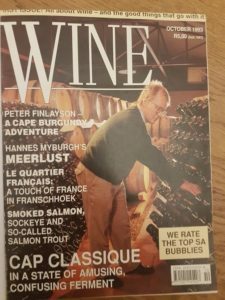 Wine magazine, the forerunner of Winemag.co.za, was launched in October 1993. The late Harold Eedes was publisher and Mike Froud, now of TopWineSA.com, was editor. 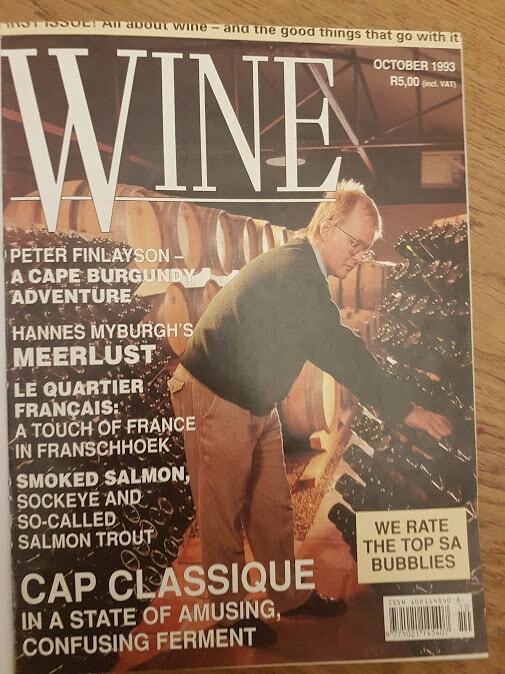 On the cover was Pieter Ferreira of Graham Beck and John Platter wrote the feature article on the adoption of the designation “Méthode Cap Classique” by 13 sparkling wine producers in 1992. The first bottling of Graham Beck Brut from the 1991 vintage had just come to market and JC Le Roux Pinot Noir 1986, selling for R22 a bottle, came tops in a bubbly category tasting. In other news, it was announced that Neil Ellis had gone into partnership with Hans-Peter Schröder in order to set up his own cellar at Oude Nektar in Jonkershoek. Michael Fridjhon wrote an article on the wine offerings of the various airlines and Dave Hughes while Dave Hughes and Jos Baker both wrote pieces about Meerlust under Hannes Myburgh’s custodianship after the death of his father Nico in 1988. 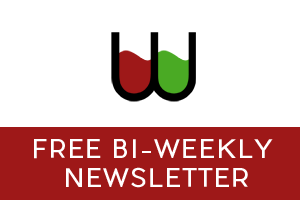 Angela Lloyd, meanwhile, wrote an article on Bouchard Finlayson, Burgundian negociant Paul Bouchard and winemaker Peter Finlayson, previously employed at Hamilton Russell Vineyards, having gone into partnership in 1990. 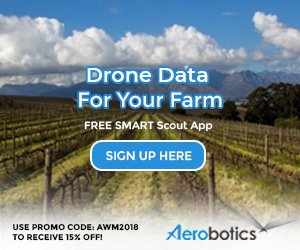 It was also reported that Storm Kreush-Dau would be taking over from Finlayson at Hamilton Russell Vineyards. In the restaurant section of the magazine, the late Lannice Snyman wrote up FranschhoekLe Quartier Français in Franschhoek, then run by John and Susan Huxter. To end the issue, an interview with Solly Kramer of liquor outlet Norman Goodfellow’s. Cava brand Freixenet, Dunhill Special Lights cigarettes, First National Bank, Perrier mineral water, Audi, Volkswagen and Pick ‘n Pay in addition to multiple wine brands all took ads while the cover price was just R5. The magazine went out of print in September 2011 and was relaunched under the new ownership of Christian Eedes (son of founder Harold) and Jacqueline Lahoud as a digital-only title in October 2014. The two sold it to US investment firm Eileses Capital in August of this year. Congratulations Christian, as you know I was involved with it in its print and online days and more recently in its digital form – you’ve come a long way my friend. Harold would be proud!